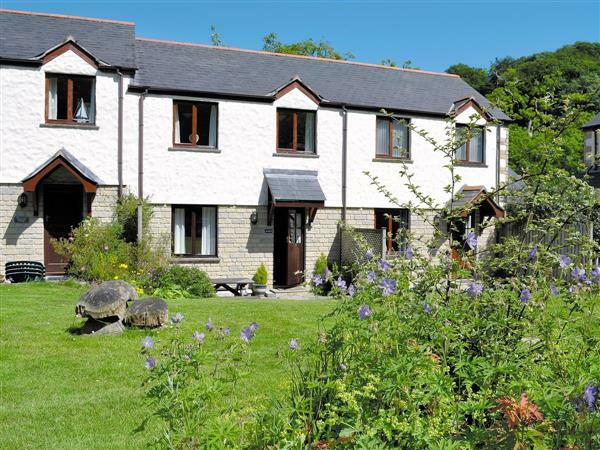 Acorns in Maen Valley, Falmouth sleeps 4 people. Acorns is an attractive house located on Pendra Loweth Holiday Village, in a picturesque wooded valley within 16-acre landscaped gardens with stream flowing through the grounds. There is seasonal use of all facilities on site (Apr-Sep) including a splash pool, gym, jacuzzi, steam room, all weather tennis courts and children’s play area. There is also a launderette and payphone on site. Falmouth is just 2 miles away with a busy port and marina, cinema, bowling, golf course, sailing and water sports; it also has many beautiful sandy beaches including Gyllingvase beach and Swanpool beach with its nature reserve and lake. Shop, pub and restaurant 1 mile. Ground floor: Living/dining room/kitchen with laminate floor. Cloakroom with toilet. First floor: 2 bedrooms: 1 double, 1 bunk. Bathroom with shower over bath and toilet. Economy 7 Night Storage Heating, electric and bed linen included. Travel cot. High-chair. DVD. Electric cooker. Microwave. Shared launderette. Dish washer. Shared payphone. Private patio with sitting-out area and picnic table. Parking (1 car). No smoking. NB: Unfenced stream close to property. Holidays at Acorns run from Saturday to Saturday. For a better idea of where Acorns is, you can see Acorns on the map below. Acorns is in Cornwall; should you be on the lookout for a special offer, you can find all the special offers in Cornwall. It's always worth checking to see what is on offer at the moment. Do you want to holiday near Acorns (25797), you can see other cottages within 25 miles of Acorns; have a look to find your perfect holiday location.